Composite wood materials were developed in the 90’s and were immediately embraced for use in outdoor decking and rails due to their durability: they are resistant to rot, water and extreme changes in temperatures, and require less maintenance than decks made with wood. Many homeowners also appreciate the eco-friendly nature of composite wood, since it’s made from a combination of recycled plastics and reconstituted wood waste. Another big perk for folks who like to enjoy their decks while barefoot: no splinters. 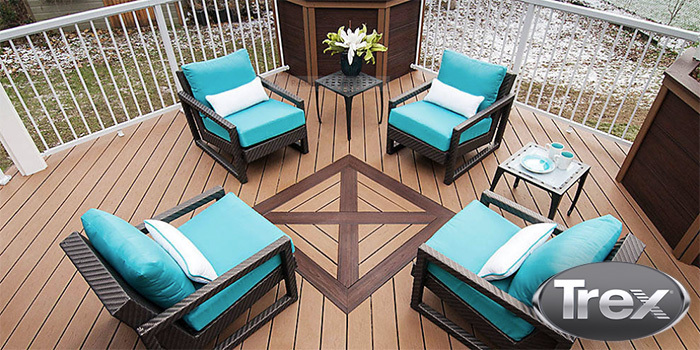 For these reasons and more, composite wood decks are enjoying a boom in popularity – and the industry leader among composite decking is Trex. In fact, Trex filed some of the first patents for the process to produce composite wood materials! Trex Composite Decking is currently available at Wholesale Siding Depot in an assortment of colors and styles. Want to learn more about Trex? Come by our showroom or see our Trex Deck and Rail page to learn more about this versatile and amazing product, and let us help you start planning your new Trex deck today!